With real estate like this you'll be shredding asap - the Heavenly Gondola is just a hundred yards from your door. Never hear the words "I'm bored" thanks to organized children's activities and a game room onsite. Whip up your signature dish or experiment with new recipes thanks to the fully equipped in-suite kitchen. With Heavenly Ski Gondola just across the street, you can be slopside in no time. Work on your flutter kick at one of two heated pools. Soak under the stars, this resort boasts 2 outdoor hot tubs. Get in touch with nature, Van Sickle State Park Trailhead is just a 3 minute drive away. An 8 minute drive gets you right to the green at Bijou Municipal Golf Course. Tucked away at the base of the mountain just a stone’s throw from Heavenly Village is the warm and inviting Forest Suites Resort. 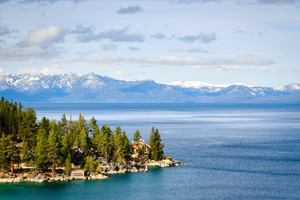 Park your car and leave it there - all of the excitement of South Lake Tahoe is within blocks of the resort. Upon check-in be sure to pick up an events calendar to peruse the resort’s many activities ranging from wine and cheese tastings for the grownups to roasting s’more at the fire pits with the kids. When it’s time to hit the mountain fuel for the powder day ahead at the extensive breakfast buffet, complete with fresh bacon, eggs and home-style potatoes. Once everyone is well-fed and warmly dressed, just waltz outside onto the slopes - Heavenly Gondola is just a hundred yards from the resort. Traveling with tots? Drop the little ones at the world-class ski school and get ready to explore Tahoe’s biggest ski destination. Boasting almost 5,000 acres of terrain and more than 350 inches of annual snowfall, it won’t take long for you to see why this place is called Heavenly. Grab a mountaintop meal, try out the terrain parks, or go in search of the DJ Cat - a retired grooming machined turned traveling dance party that roams Heavenly mountain during peak season. After an adventure-filled day on the snow head back to Forest Suites for a hearty home-cooked meal (hooray for en-suite kitchens) and a soothing soak at the open-air hot tubs. One- and two-bedroom apartment style suites are tastefully decorated and well appointed. A fully equipped kitchen has all the necessities for cooking up your signature dish, with a dining table fit for family dinners and game nights. A living area with cushy couches and a flat screen TV is the perfect spot for relaxing during downtime. With a sleeper sofa in the common area and comfy king in the master, these suites are prime for small families and friend groups. Heavenly Village houses all the family-friendly fun you can expect from a ski resort, from ice skating and snow tubing, to dog-sledding and snowshoeing. But once the sun sets on the high Sierras, South Tahoe’s nightlife come alive. Planning a grownups-only night on the town? No need for a DD since the casinos and clubs at MontBleu, Harvey’s and Harrah’s are all easy walking distance from Forest Suites! Catch a comedy show at The Improv, dance the night away at Opal Ultralounge, listen to live blues music at Harrah’s Center Stage - or test your luck at the tables.